Just across the courtyard from the main house and guest room the cottage offers you a pied à terre in the Entre Deux Mers countryside. Here you can go to the out door markets and come home and cook up a storm or take time out in a quite haven where you can curl up with a book….or take out your pen and start wrtiting one. The south side of the court yard with the door to the cottage and the door leading out to the gardens. The living room/bed room with a sofa and arm chair as well as a large double bed. On the mezzanine above is a desk and daybed. 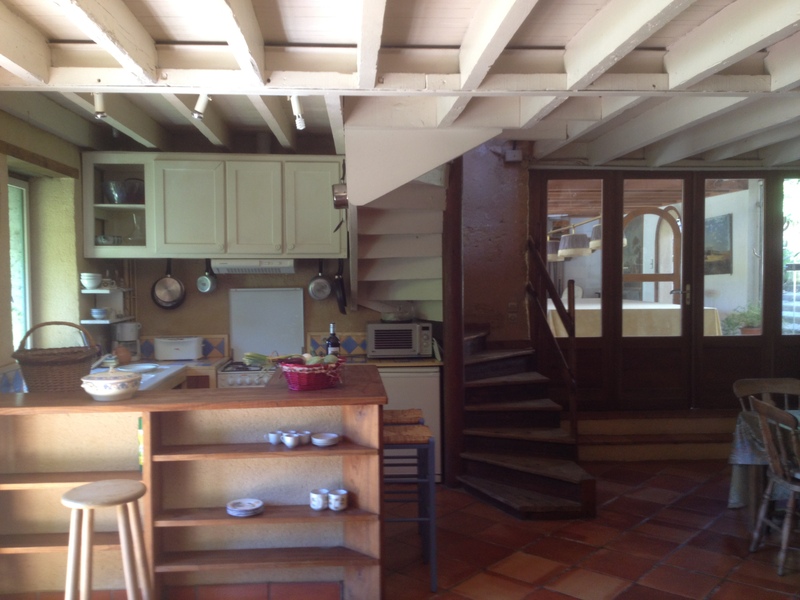 The kitchen is simple but well equiped with everything you need for french cooking. The bathroom has a large skylit shower. Pictured below is thecottage’s private garden with a stone table overlooking the fields and vinyards. 95€/night (two night minimum or 600€ week. Open all year round with hot water, underfloor heating and a supply of firewood available for the fire places. Bed, bath and kitchen linens provided, just bring your beach towel ! For stays over a week, we supply fresh linens. The cottage will be cleaned at the end of each week. Out of season it’s possible to have a special rate for a long term stay. The hamlet of Pey Froment was built in the 12th century around a water mill that still exists …it’s now our annex. 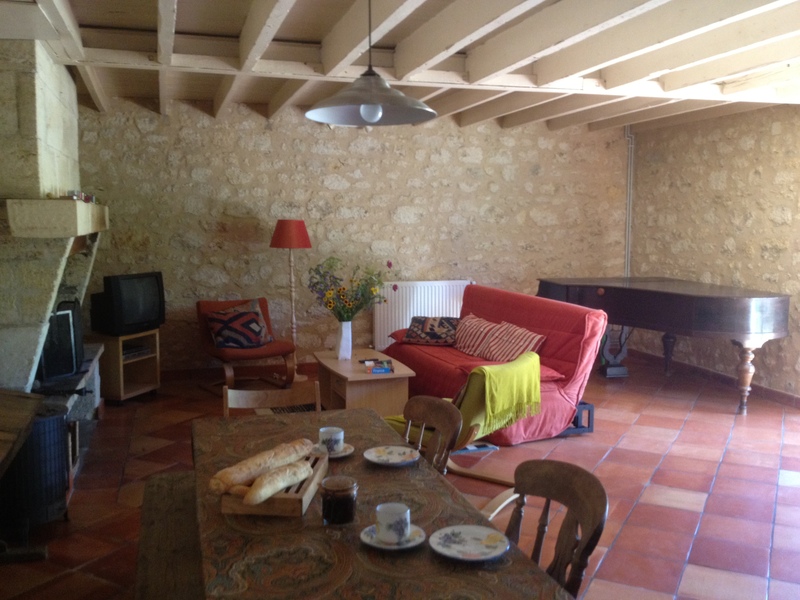 There’s a guest room and a gite (self catering unit) …and our swiming pool ! Just off the D936, surounded by fields, streams and woods it’s a wonderful place for getting away from it all but at the same time staying close to where the action is…the country action of a little farm with the usual chickens and ducks and fields full of sheep…and the gentlemen farmers: my husband Bruno and his brother Alain. Their main activites when not at their Bordeaux university or office are running the farm and the vineyard: planting their vegetable gardens, haying, keeping the animals happy and the vines ready for harvest. 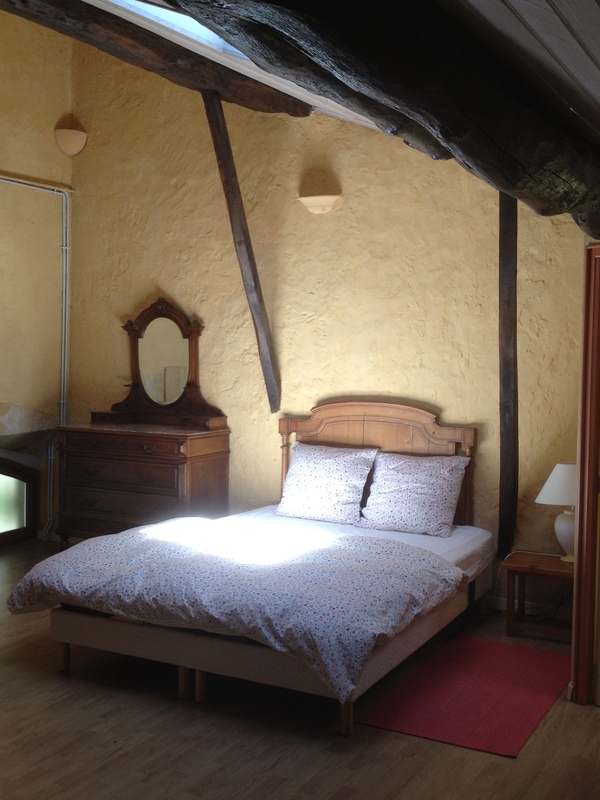 The gite is perfect for two adults but can also make room for a baby or a child. A large livingroom/dining room with a corner kitchen: sofa, comfortable chairs, dining table and tv. Upstairs a bed room: double bed, a single bed and chest of draws and closet. Separate bathroom (shower) and toilet. price 450€/week from June through September. Out of season it’s sometimes possible to have a special rate for long term stays.